Located in the Salt River Valley, which is sometimes known as the "Valley of the Sun", in central part of the state, Phoenix is the state capital and largest city of Arizona. 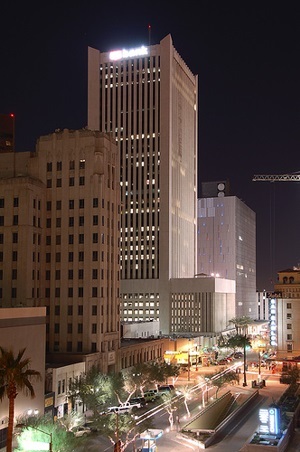 As of the 2005, the estimated population of the city itself was 1,461,575, with an estimated 3,715,360 living within the Phoenix Metropolitan area. The city has at an average elevation of 1,117 feet (340 meters), and is located in the northern reaches of the Sonoran Desert. The Salt River runs westward through Phoenix, but because of the desert climate and dams up river, the Salt River is normally dry - water only being present when water is released from dams that lie up river. Perhaps the most famous educational institution in Phoenix is the University of Phoenix, which is a for-profit educational institution that specializes in adult education. Professional sports franchises in Phoenix include the baseball team, the Arizona Diamondbacks, and the NBA basketball team, the Phoenix Suns. The main airport serving Phoenix is Phoenix Sky Harbor International Airport. 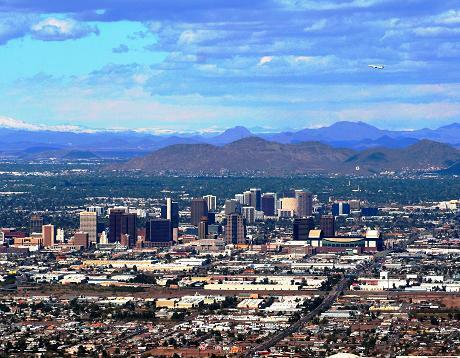 Phoenix is nicknamed "Arizona's Urban Heart", while the Phoenix metropolitan area is nicknamed "Valley of the Sun".